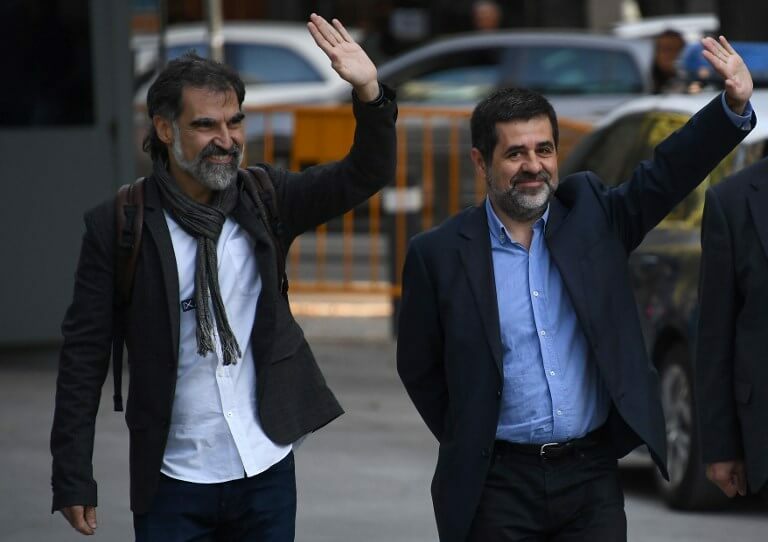 On 16 October 2017, Jordi Sànchez and Jordi Cuixart became the first pro-independence leaders in Catalonia to be sent to jail for helping organise a self-determination referendum deemed illegal by Spain. One year on, these two activists remain behind bars. Cuixart and Sànchez (often referred to as the ‘Jordis’) were the first of many to follow: the then-vice president Oriol Junqueras, five ministers, and the former parliament speaker Carme Forcadell were subsequently imprisoned. Others, like ex-president Carles Puigdemont, left the country to seek exile in other European countries. They’re all accused of violent rebellion, one of the most serious offences in the Spanish Criminal Code, which implies the use of violence and carries prison sentences of up to 30 years. Defendants have repeatedly denied the charges and insist they are committed to achieving independence by peaceful means. In the run-up to the referendum, the Jordis were the leaders of the two leading pro-independence grassroots organizations in Catalonia: Òmnium Cultural, and the Catalan National Assembly (ANC). The same groups that organise the mass pro-independence demonstrations every year for ‘La Diada‘ – Catalonia’s National Day. It was for a protest that they were sent to jail. Just a few days prior to the referendum, Spanish police raided Catalan government buildings to halt preparations for the vote. Pro-independence supporters protested en masse. The Jordis called on people to stay calm, formed a safety cordon, and eventually asked people to leave – yet, they are accused of being the instigators of the protests and of impending police work. Cuixart remains the president of Omnium, but Sànchez left his post to join Puigdemont as his number two in Junts per Catalunya (JxCat), the most voted pro-independence party in the last election. He was even put forward as a candidate for president by Puigdemont when Spanish courts refused to let him retake his post from abroad, but nor did they allow Sànchez to be elected from prison. On Monday, a day before the first anniversary of their imprisonment, Amnesty International insisted on demanding the “immediate release” of the ‘Jordis’, claiming there is ‘no justification’ for keeping them in jail.